At Educating Kids Outdoors we recognise that all children learn effectively in different ways, in different situations using different inspirations. We believe that the outdoors provides a perfect setting for all children to learn and problem solve in a calm, creative and considered way. 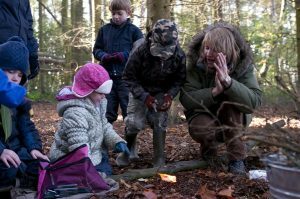 We have been involved in outdoor learning for many years working with children of all ages and with different learning needs and we never tire of seeing children respond positively and excitedly to the space and freedom of the natural world within our structured yet free learning approach. Our ethos is one of ‘learning through play’ and during EKO sessions the children are given the space and the opportunity to think, to wonder, to discuss, to create, to innovate, to discover, to marvel , to enquire and to connect with their natural world. We currently run regular weekly sessions in schools all over Shropshire, Telford & Wrekin and Staffordshire, both during school time and in after-school clubs. We also offer bespoke school days and/or half days on particular curriculum or co-curriculum topics and themes. We run events for home-schooled children either on a curriculum linked theme or just as a bushcraft adventure type day. We run a special ‘Ministry of Kids’ Holiday Club for 2 days each school holiday and half term. We run EKO birthday parties for younger children at Apley Farm Shop, near Bridgnorth and are also available to do bespoke events and parties for adults and children. EKO sessions can based around basic bushcraft, science, maths, literacy, our natural world, seasons, constructions, sustainability or other topics that are relevant to your pupils and teachers. For younger pupils we can do sessions around the Gruffalo, The Hungry Caterpillar, We’re Going on a Bear Hunt. All EKO leaders have teaching qualifications and experience of delivery, as well as being passionate about Outdoor Learning. All have Outdoor Learning experience and qualifications either as Forest School Leaders, Bushcraft Leaders or Outdoor Educationalists and are all First Aid Qualified, DBS checked and fully insured. All EKO sessions are run according to the recommended adult:child ratio and risk assessments are produced for each event and activity.